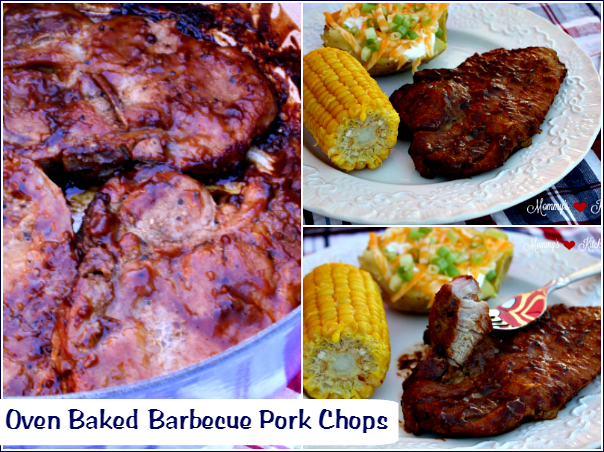 Tender pork chops seasoned with a barbecue dry rub and smothered in your favorite barbecue sauce and apple cider. Today I have a simple dinner recipe to share with you. 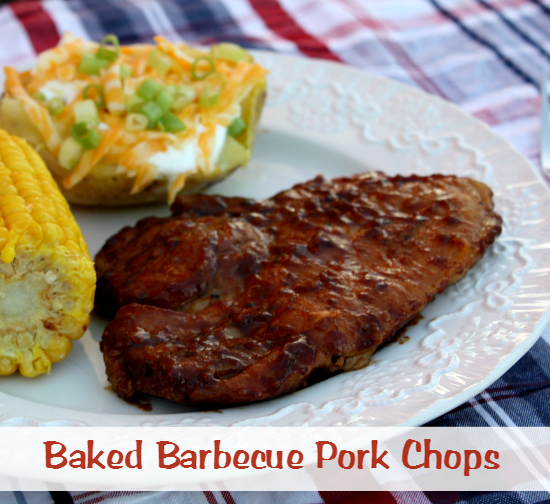 We love pork chops in our house, and I cook and grill them quite often. My husband prefers pan fried and grilled pork chops, but I like pork chops just about any way you can cook them, especially smothered in a variety of delicious sauces. 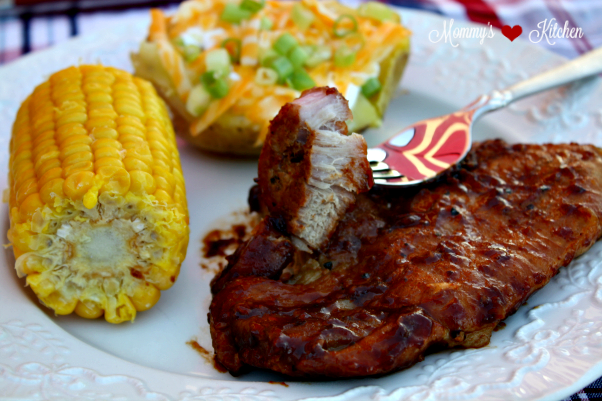 These oven Baked Barbecue Pork Chops are one of my go to recipes to please everyone in our house. My son loves barbecued ribs, so this is one of his favorite meals. 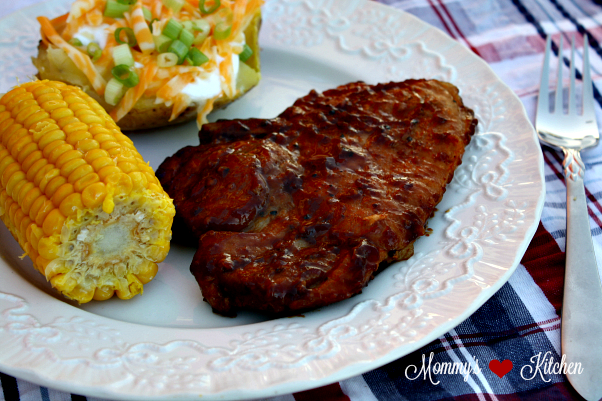 These easy barbecue pork chops are packed with flavor and turn out tender and delicious every time! I like to use a bone in pork chop for this recipe, but you can certainly use boneless. I prefer bone in chops for baking because they're less expensive, tender and in my opinion have more flavor than boneless chops. I also like to sear the pork chops in my dutch oven before baking. Searing the chops first adds a beautiful coloring and sears the dry rub into the chops making them so flavorful. Serve these barbecued pork chops with a baked potato, salad and a veggie or just serve alone with a garden salad for a light summer meal. Let's get started on this easy recipe. Preheat oven to 375 F degrees. Heat the olive oil in a large dutch oven over med-high heat. In a small bowl, mix the brown sugar and the dry rub together. Sprinkle the mixture on both sides of the pork chops, rubbing the dry rub into the meat on each side. Add the pork chops to the dutch oven and sear on both sides. Add the onion rings over the pork chops. Cover the dutch oven and bake the pork chops for 30 minutes. In a separate bowl mix the barbecue sauce and and apple cider together. Using a basting brush, coat the pork chops on both sides and pour the remaining sauce over the chops. Bake the pork chops uncovered for an additional 15 minutes. Preheat oven to 375 F degrees. Heat the olive oil in a large dutch oven over med-high heat. In a small bowl, mix the brown sugar and the dry rub together. Sprinkle the mixture on both sides of the pork chops, rubbing the dry rub into the meat on each side. Add the pork chops to the dutch oven and sear on both sides. Add the onion rings over the pork chops. 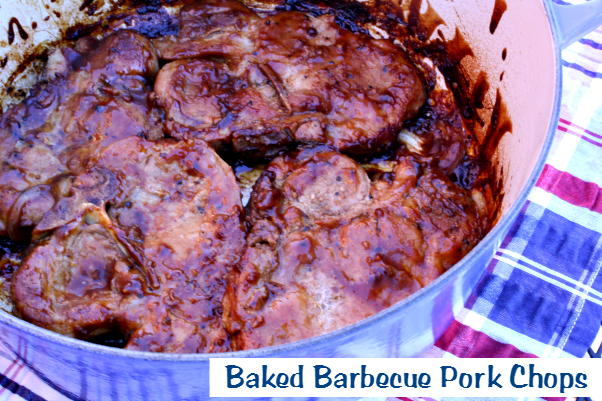 Cover the dutch oven and bake the pork chops for 30 minutes. In a separate bowl mix the barbecue sauce and apple cider together. Using a basting brush, coat the pork chops on both sides and pour the remaining sauce over the chops. Bake the pork chops uncovered for an additional 15 minutes. Remove from oven and serve with additional sauce if needed. This recipe sounds great! I dont have a dutch oven, do you think it would be ok to skip the searing step and bake in a pyrex dish covered with foil? The searing really give the meat a great flavor. I highly recommend searing before baking even in a casserole dish.